Celebrate the mystery of the Holy Spirit through this refreshing, yet familiar Mass setting from Paulist Father Ricky Manalo. This is the keyboard/unison accompaniment book for Mass of Spirit and Grace, a new Mass setting by Ricky Manalo, CSP. 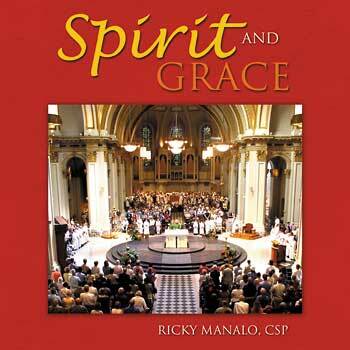 This is the guitar/unison accompaniment book for Mass of Spirit and Grace, a new Mass setting by Ricky Manalo, CSP. Celebrating the mystery of the Holy Spirit, Mass of Spirit and Grace infuses texts from the Roman Missal, Third Edition with strong and approachable melodies that help your congregation reflect upon their lives with Christ. This versatile Mass setting, which marries a traditional style with contemporary sound, also includes two settings for the sprinkling rite as well as general and seasonal verses for the Gospel acclamation that engage the assembly in a call-and-response format. Particular to this Mass setting—and developed in close collaboration with the USCCB Secretariat on Cultural Diversity as well as diocesan leaders and liturgical composers—the multilingual intercessions can be sung in 30 different languages! This unique adaptability helps you unite your multicultural community in prayer at Mass, Liturgy of the Hours, prayer services and more. Welcome the word of the Lord with new songs that feel like old friends, and engage your congregation’s faith with Mass of Spirit and Grace. This keyboard/guitar presider edition songbook also includes the accompaniments for the Eucharistic Prayer II and III.